C3 Collaborating for Health | Workplace cake culture: health risk or sociable morale booster? 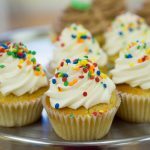 Blog » Workplace cake culture: health risk or sociable morale booster? When I was planning my research into office cake culture, cake-related discussions with friends and colleagues often led to the same full and frank discussion. Some argued that if you eat too much cake or other snacks you risk weight gain leading to health risks for individuals and productivity-related consequences for employers. The counter-argument was that office cake provides a valuable opportunity for colleagues to take a break, catch up with colleagues and share ideas. No data existed so I had no idea what the research would tell us. Intriguingly, the results suggested there’s merit in both positions and both provide insights that could help improve workplace health and wellbeing, physical and mental. The research surveyed almost 1000 UK office workers about their attitudes, habits and opinions around workplace cake culture. It found cake was available to most respondents (86%) at least ‘once or twice a week’. 31% said office cake had contributed to weight gain, 38% said it made it harder to eat healthily in the workplace and 59% said it made it harder to stick to a weight loss diet. Round one to the ‘office cake is bad’ camp. But wait. 61% thought office cake was a good thing, 81% said it brings people together and 83% said it cheers people up. Round two to the ‘office cake is good’ camp. The ‘wow!’ data that brought all this together was that, asked what they thought was the ideal frequency for office cake, 95% of the respondents said once a week or less. 41% said once a month. Let’s say that again. 95% of respondents said the ideal frequency for office cake was once a week or less. So the evidence is telling us that workplace cake affects many people’s efforts to eat healthily at work and control their weight, yet it also provides a popular way to boost morale and build relationships. But however respondents felt about workplace cake, almost all considered cake once a week or less to be enough. Until now, without hard data it has been difficult for employers to know whether or how to respond to cake culture. It probably isn’t even on the radar for some. However, workplace health promotion makes sense on many levels and is a priority for many organisations. But this new data suggests investment in workplace health promotion could be undermined by cake culture. After all, does it make sense to invest in healthy canteen food, fruit bowls, subsidised gym memberships, health schemes etc and then introduce – even welcome – a flood of sugar and calories in the form of cake? It’s important to emphasise at this point that if cake is available, people will eat it. 92% of respondents said if cake was available, they ate it at least sometimes; 41% said they always or often ate it. 36% never refused it. This finding is supported by evidence from other studies that the thought, sight or smell of palatable food stimulates hunger and the motivation to eat [1,2,3]. So the “no one is forced to eat cake” or “people can make up their own minds whether or not to have it” arguments unfortunately just don’t hold water. The good news for employers is that even if people don’t agree about the positives or negatives of office cake, they do agree on how often they think it should be available. And agreement is a good position from which to start making changes. The best thing employers can do is encourage a conversation about the cake culture in their workplace. There is a strong chance people will realise they all have something in common, ie they’re in the “office cake is great, but once a week is enough” camp – even if it’s for different reasons. The conversation might involve facilitated meetings, suggestion boxes, intranet polls or other ideas generated by employees. Supportive management can encourage and endorse but won’t need to regulate. What better way to cultivate a culture of health that everyone buys into? Discuss how to make cake special again. What would make it something to look forward to? Stop displaying cakes openly all day in the main working area (as happens for nearly three quarters of respondents). This encourages mindless grazing and doesn’t provide the social gathering people said they enjoy and value. Instead, choose a day and time for cake every week/month/whatever people agree. Until cake time, keep the cakes out of sight (and out of mind) in opaque cake tins, in cupboards, ideally somewhere relatively inaccessible. When cake o’clock has finished, pack the cakes away. What alternatives are there to leaving leftovers lying around or giving them to another team/department? Discuss how to deal with weeks with multiple birthdays and celebrations. Can they all be celebrated in one big celebration? How would people feel about not bringing edible treats back from holidays and business trips? Would anyone miss them? Or could these also contribute to the weekly cake occasion? Which healthier alternatives to cake and sweet treats would work? The research found fruit to be the most popular alternative with ‘cake less often’ the second-most popular. Nuts and vegetables/dips were not far behind. Explore new ways to get the social benefits of getting together with colleagues without the health risk of sugar. Team lunches/picnics? Table tennis tournaments? A walk? 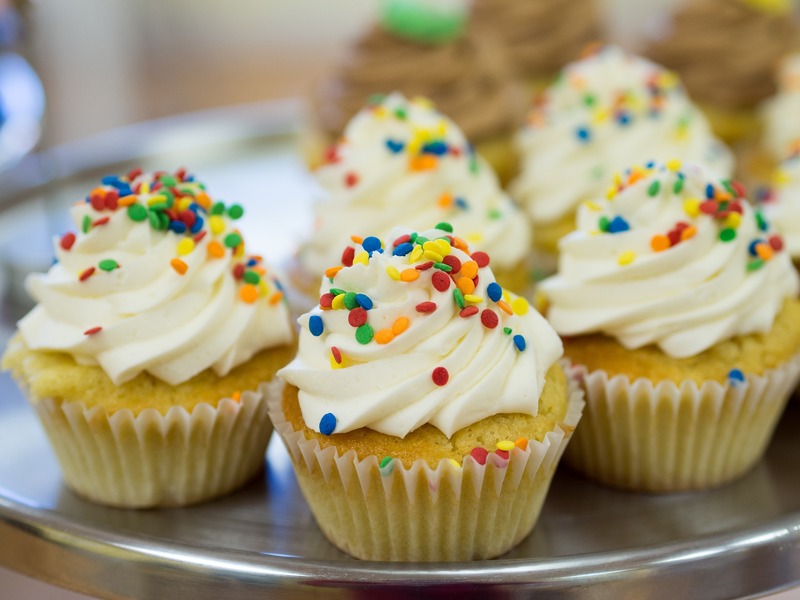 If there’s a cake club, could club members be challenged to provide cakes with less icing and sugar and a higher proportion of healthier ingredients? Encourage all cake providers to bring in homemade treats rather than shop-bought ones. Half the research respondents said ‘hardly any’ office cake was homemade. Shop bought products are more likely to contain a higher quantity of unhealthy ingredients. Depending on the organisation’s culture, people might need help to get the conversation started. The research indicated office cake can be an emotive topic with passionate advocates on all sides which might make it uncomfortable for many people to speak openly at first. For this reason I provide a short 10-item questionnaire which organisations (or individual teams or departments) can circulate by email to gather anonymous data about prevailing opinion. This data provides an objective basis for discussion. Other aspects of workplace snacking are also worth adding into the conversation. Bowls of sweets and other free of charge snacks appeal to many employees and appear friendly and generous but will not be supporting good health. How do people feel about this? Can you request healthier vending machine offerings? And what about meeting refreshments? The research found half the respondents thought meeting refreshments were not healthy enough and that the second-most popular source of office cake was meeting leftovers – a double whammy in terms of cost and health risk. This research investigated the opinions and behaviours of office workers so might not translate completely to other working environments. But the implications are still clear. In 2013, the World Health Organisation calculated we spend two thirds of our waking hours at work so a healthy working environment could make a significant contribution to overall public health. Starting a conversation about office cake is an easy, practical (and cheap) place to start. Ferriday, D., & Brunstrom, J. M. (2011). ‘I just can’t help myself’: Effects of food-cue exposure in overweight and lean individuals. International Journal of Obesity (2005), 35(1), 142. Ramaekers, M. G., Boesveldt, S., Lakemond, C. M., van Boekel, M. A., & Luning, P. A. (2014). Odors: Appetizing or satiating? Development of appetite during odor exposure over time. International Journal of Obesity (2005), 38(5), 650. A version of this blog originally appeared on www.louwalker.com. Want more about workplace cake culture? Watch Lou’s 2018 TEDx Talk ‘Why we need to talk about cake’. Lou Walker is a researcher, speaker and writer now focussing on workplace health and wellbeing after 16 years as a leadership development consultant. Last year she completed an MSc in Obesity & Weight Management during which she conducted the first research to explore attitudes and behaviours associated with office cake culture. She was recently shortlisted for an Inspiring Wellbeing Award at the Wellbeing Symposium 2018. 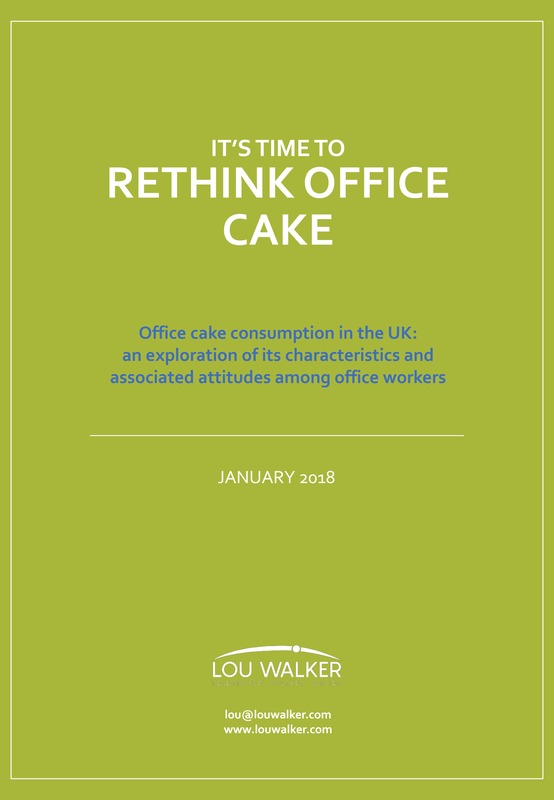 To download the research report “It’s time to rethink office cake”, get help with starting an office cake conversation, or request the survey for circulation in your workplace, visit www.louwalker.com. Lou Walker is a researcher, speaker and writer now focussing on workplace health and wellbeing after 16 years as a leadership development consultant. She was recently shortlisted for an Inspiring Wellbeing Award at the Wellbeing Symposium 2018.